Breakfast will be served at the Middle/High School from 8:00 to 8:30 each weekday morning when school is in session, beginning Monday, August 27 th . Cost is $1.75 per student. Students who qualify for reduced-priced meals or free meals may receive free breakfast as well. 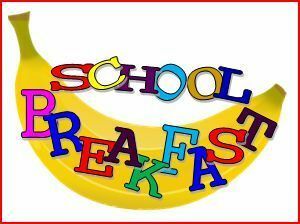 All students, grades K-12, may take part in the breakfast program. Each day cereal, toast, peanut butter and jelly, milk, and fruit or juice will be served; in addition, the cooks will prepare a breakfast dish such as French toast, scrambled eggs, breakfast pizza, etc., which may be substituted for the cereal.